Episode Review: SPARTACUS: BLOOD AND SAND, "Kill Them All"
Last night's Season 1 finale of Spartacus: Blood and Sand was aptly named because well...they killed them all. The entire season has been leading up to Spartacus learning that Batiatus staged his wife's murder, which of course would send the gladiator into a whirlwind of rage, but the Thracian proved that he is a champion by staging a calculated revolt. He was even able to convince his enemy, Crixus, to join his cause. S:B&S has always been an over-the-top guilty pleasure show for me, but I was surprised how wrapped up I got in tonight's episode. I knew what was coming, you know the killing of everyone, but I was still on the edge of my seat while watching the mayhem ensue. I mean they killed them ALL! Batiatus and Lucretia fell (well I'm sure the former is dead, but Lucretia may still be alive), and I was a little shocked by it all. Batiatus was the perfect villain for the show because he was ambitious, charming, deceitful, but you always kind of respected him. To see him taken down so easily was appropriate since he's only a promoter and not a warrior, but I wasn't expecting him to meet his end tonight because that really doesn't leave an antagonist for Season 2...well except for one. The only character more villainous than Batiatus was Ilithyia whom hated Spartacus with a passion, and I can see her and her husband take over the title of Season 2's big bads. Itithyia has a Lady Macbeth vibe going for her, and it'll be nice seeing her wrap her husband around her finger in order to get back at Spartacus, but then again the same can be said for Lucretia. Either way, I'm predicting a lot of woman on top evilness for next season. While Season 1 of Spartacus wasn't high-brow, sophisticated television fare, it was a whole lotta fun to watch, and I'm pretty excited that it was picked up for a second season. 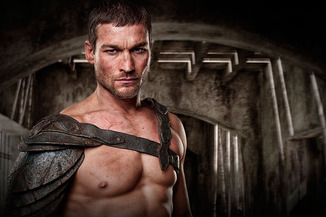 I just hope Andy Whitfield, Spartacus himself, successfully fights off his Non-Hodgkin lymphoma and has a speedy recovery.